Can you tell who's really an Idiot and who's just Faking? Can you tell who's really an Idiot and who's just Faking? 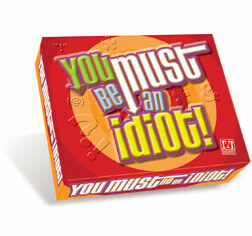 Each round, everyone is dealt a card telling them whether they are an Idiot or not. The current Genius gets to ask a special Trivia question of their choice from the card in their hand. Everyone writes their answers down, BUT.. if you're and Idiot, you MUST answer incorrectly... Once all the answers are revealed, it's your job to figure out who's definitely and Idiot. Gotta be careful though! Call somebody an Idiot who's not and they steal points from you! And Idiots who don't get caught get BONUS points! So the question you have to ask in this game is.... Who's REALLY the Idiot and WHO's just fooling? 3-6 players Contents: Board, EZ-Play rulesheet, 19 pawns, 180 Trivia question cards, 60 WHO-AM-I? cards, 6 pencils, 6 answer pads.